I had so much fun playing with our new Beautiful Blizzard stamp set I have two more fun cards to share today! 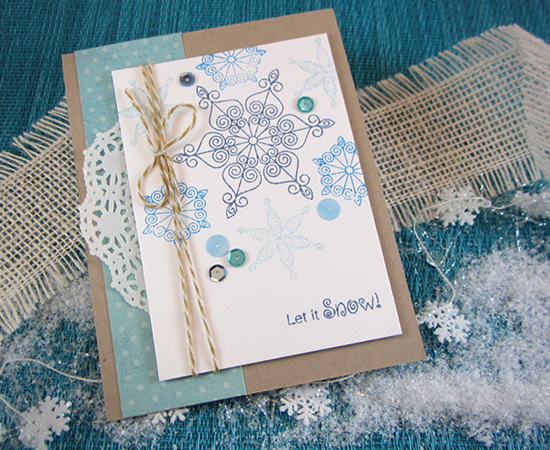 For the first card I stamped the snowflakes and the "let it snow" in different shades of blue on white card stock. Then I added some sequins and some fun brown/white bakers twine. I mounted it onto the kraft card stock base with some blue polka dot paper and a bit of doily. Love the simplicity of this card! I don't know about you but I am LOVING the combo of the "kraft" brown and shabby items like burlap mixed with sparkle and metallic! That's exactly what I did for this card. 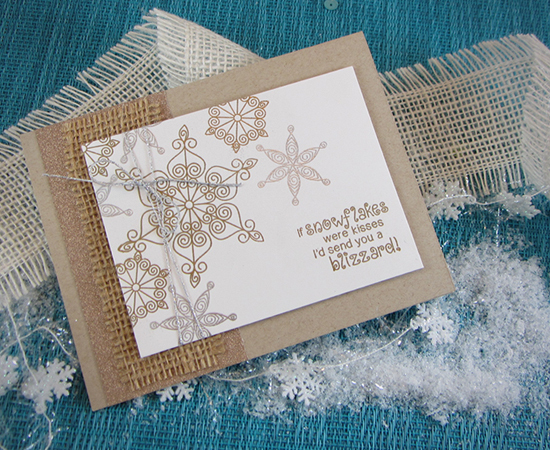 I stamped the snowflakes with god and silver ink on white and then added some silver twine. Then I put it together with some sparkly gold cardstock and burlap! Love this look! So pretty and festive! Our November stamps are now available + Free Shipping! Gorgeous! Both are beautiful but the second one really caught my eye! The burlap looks amazing! I love how you staged your cards too - fabulous! Two wonderfully beautiful snowflake cards. The details in this set: amazing!